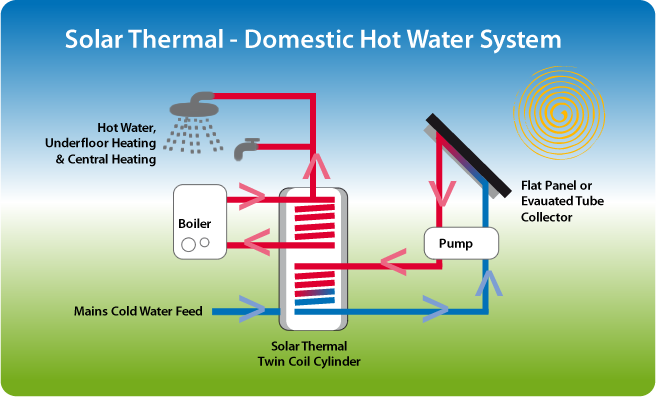 The most cost-effective, affordable renewable energy technology currently available for domestic and commercial applications is solar thermal water heating - the technology that allows to effectively collect and utilise solar energy radiated by the sun to heat the water. Solar thermal technology transforms direct and diffuse solar radiation into useful solar thermal heat using solar thermal collectors. The heat is then used to heat water in domestic and commercial properties which at the same time helps to decrease carbon emissions and reduce global warming as well as offering a sustainable solution. Solar energy is free, clean and safe. It is environmentally friendly and produces no waste or pollution. Using solar energy enables you to reduce not only your carbon footprint and promoting sustainability but also your energy bills. The whole process is simple and effective and entirely renewable – something which has to be good for both the environment and for future generations. Solar thermal offers an affordable and practical renewable energy solution. Vacuum tube solar thermal collectors are currently considered the premium product on the market. They are the most efficient solar thermal collectors available and are on average 30 percent more effective than ‘traditional’ flat plate panel equivalents. 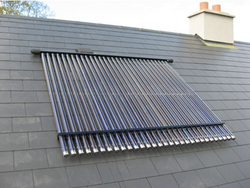 Each vacuum tube solar thermal collector consists of a highly insulated manifold and a row of solar tubes. The vacuum inside each tube ensures the most effective transfer of energy into heat as well as providing perfect insulation. It protects the system from outside influences, such as cold, wet or windy weather, resulting in consistent high quality performance all-year-round. Vacuum tube collectors can provide up to 70% of annual hot water requirements with zero carbon emissions. They are also flexible for building integration, fitting perfectly on sloping roofs, flat roofs or even façades. They are quick and easy to install as the tubes can be carried and fixed onto the roof individually. 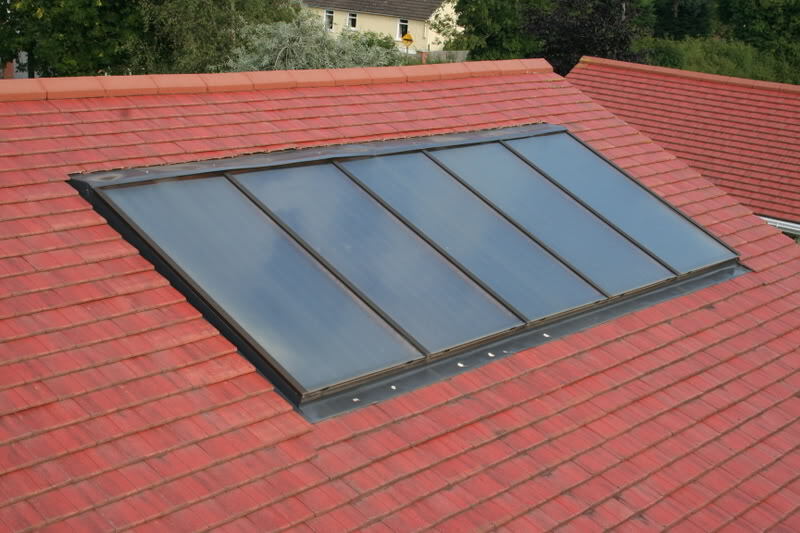 Flat plate panels are the most popular solar thermal collectors on the market. They provide a cost-effective solution both in domestic and commercial applications and deliver excellent levels of efficiency and performance. Each flat plate panel consists of a dark flat-plate absorber of solar energy, a transparent cover that allows solar energy to pass through and reduces heat losses, a heat-transport fluid (typically antifreeze) and a heat insulating backing. They are robust, hard-wearing and flexible in installation with both ‘in-roof’ and ‘on-roof’ options. ‘In-roof’ installations typically take place on new build properties. The solar panel is encased in a cassette unit that is then mounted directly onto the roof battens. The roof is then tiled up to the cassette, not only to provide a weather-tight installation, but also to maintain the integrity of the roof itself. The ‘on-roof’ option tends to be favoured for use on existing properties, as the solar panel is mounted on top of the existing roof tiles on brackets that penetrate through the roof and are bolted to the rafters to ensure a secure fixing. • Ensure that your site is suitable for a Solar Thermal system. • Ensure that the electrical and plumbing installation is up to date and meets with current safety regulations. • Check site access and roof conditions for installation feasibility, issues and costs associated to the solar panel installation. We will then prepare a detailed site survey report that will include all the above items and send this to out to you along with your quotation. Once you have had the chance to review your quotation you may want to discuss any issues with our team and make any changes that you think are needed. Once you are happy with the quotation and have obtained planning permission (if required) you can place your order for your Solar Thermal system. If required, we will arrange for scaffolding to be in place prior to the installation of your Solar Thermal system onto a roof and removed afterwards. Installation usually takes no longer than a couple of days and once completed you can start enjoying the benefits of Solar Thermal system. We will then provide you all the required information to enable you to complete the RHI (Renewable Heat Incentive) application.